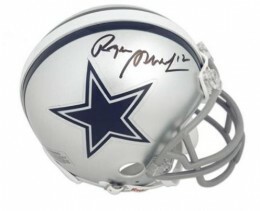 Roger Staubach football cards and autographed memorabilia have, and always will be, a solid choice for collectors. As the leader of the Dallas Cowboys in the 1970s, Staubach's epic head-to-head Super Bowl battles against Steelers quarterback, Terry Bradshaw, are fondly remembered. 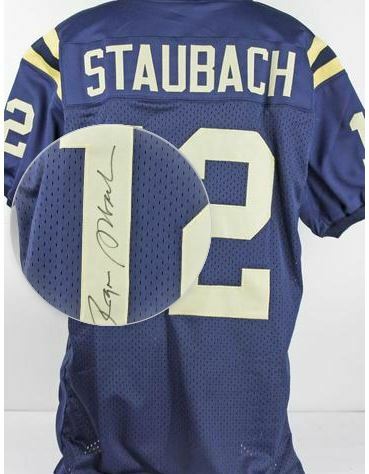 As such, demand remains strong for Roger Staubach signed memorabilia and high-grade vintage cards, particularly his 1972 Topps Football rookie card. What some collectors may not be aware of, is the fact that Roger Staubach has several available cards produced prior to his Topps rookie. Several from team-issued sets with Roger Staubach cards date back to 1969. 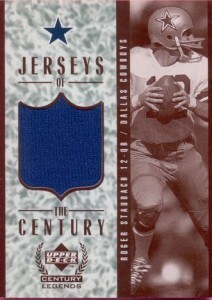 Staubach has eight of these team issued card released between 1969 and 1972. These cards were over-sized in nature. Sizes vary slightly from year to year.. Other early Roger Staubach cards and ephemera include: 1971 NFLPA Wonderful World Stamps, 1972 NFLPA Fabric Cards, 1972 NFLPA Vinyl Stickers, 1972 NFLPA Wonderful World Stamps and the 1972 Sunoco Stamps. Roger Staubach has also been a standard in many modern sets. As a two-time Super Bowl Champion and Hall of Famer, the quarterback has several cards featuring his signature and memorabilia. 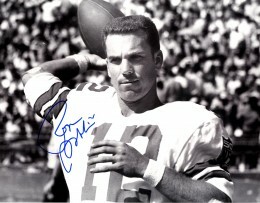 Typically rare, Roger Staubach autographed and memorabilia cards still sell well above average compared to other players from his era. A truly iconic card, Staubach's determined stare is a reflection of how he played the game: with precision, focus and smarts. The pink border and contrasting yellow lettering provide a color scheme that immediately captures your attention. 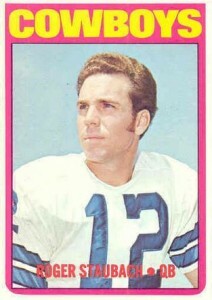 In addition to this card, Staubach has three other cards in the 1972 Topps Football set including an In Action card (#122), NFC Passing Leaders (#4) that he shares with Greg Landry and Bill Kilmer, and the Super Bowl card (#139) that honors the Cowboys beating the Dolphins 24-3. 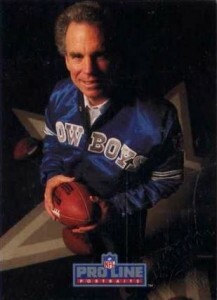 Staubach has an in-game photo as he is rolling-out of the pocket. 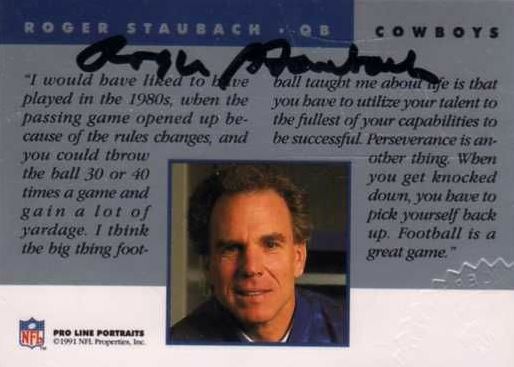 Roger Staubach's first certified autograph card is in 1991 Pro Line Portraits. Additionally, 1992 Pro Line Profiles as a total of nine different Roger Staubach autographed cards (#37-45). In 1996, Collector's Edge produced an autographed card depicting the famed Hail Mary pass to Drew Pearson. That card is serial numbered to, a then scarce, 1,000 copies. Finally, in 1997 Upper Deck included Staubach on the autograph checklist in the SP Authentic (card #8) and Legends (card #AL11) brands. It wouldn't be until 1999 that collectors could pull a Roger Staubach memorabilia card, which can be found in 1999 Upper Deck Century Legends Football. The autographed version of the base card is identical. You can be sure that the one you are buying is authentic because of the embossed labeling that you can see on the bottom right corner of the back of the card. Additionally, the embossing is thick enough that it can be seen on the card front as you can see here. Produced at a time when memorabilia cards were still in their infancy, this is Roger Staubach's very first game-used memorabilia card. The retro black and white photograph paints an amazing contrast to the royal blue of the jersey swatch. The exact print run of the card has not been made public. Below you will find examples of what an authentic Roger Staubach autograph looks like. This can be used as a first point of reference for determining the legitimacy of autograph memorabilia, but is not a substitute for having your items authenticated by a well-respected professional autograph authentication company. Some of the trusted sources within the sports memorabilia market include the following companies: PSA, JSA, Steiner, Tristar and Mounted Memories. Click on any of the images below to view full size photos. A fairly legible and even handed signature written on a relatively even horizontal plane. The letter "R" is indicated by an odd kidney bean type shape. The letter "o" is legible as well as the "g" which makes an angular shaped "9." An extending line off the "g" implies the letters "e-r."
The letters "S-t" combine to form his signature star shape. The remaining letters are all legible except for the letter "h" which is often left off. The first "a" is often open with the second being more implied and closed. 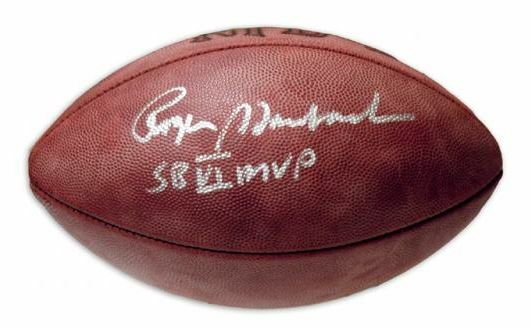 ROGER STAUBACH SIGNED FOOTBALL IN PERSON w *JSA* AUTHENTICATION.